Here's a different perspective on combining the serenity and beauty of our salt marshes. Our floating yoga sessions will take you on a short journey into the depths of the universe via standup paddleboards. After a little introduction on how to standup and paddle, Martha Haynes will take you on winding creeks to a quiet, private expanse of nature. After some relaxing, eyes closed, pranayama (breathing) meditation, Martha will then lead you through your favorite asanas, as well as a few new ones....all the while balancing on your board... suspended above the earth, beneath the sky. It's fun, it's easy, a little cosmic, but best of all, it's healthy. Space is limited. Call make a reservation. We will be at Butterbean Beach with a general selection of kayaks to try out. Among others, we will have the Slayer Propel, the popular Moken fishing boats, several Stellar models including the S18S, and the Tiderace Vortex. This will be a great opportunity to try stand up paddleboarding. We will also have a few paddles to try, including Saltwoods and some bent shaft models. Give us a ring if you want to try out a particular boat or board and we'll add it to the line up. This weekend (03.29 &30.14) I had an opportunity to participate in the ACA Guide Certification course led by one of your staff guides, Steve Braden. The course exceeded my expectations on many levels. I am an experienced expedition paddler of 30 years with numerous multi-week expeditions under my hull. Yet, the ACA curriculum for this course was full of useful information that reminded me of many aspects of paddling that I had forgotten and introduced me to new techniques, terms and procedures that had been developed over the years. Though the information was interesting and added to my paddling and instruction knowledge, the instructor most impressed me. Steve was professional and extremely knowledgeable. His many years of kayaking and outdoor education were very evident through his broad knowledge of not only the curriculum but the history and development of each aspect of the course. His demeanor and presentation was to-the-point, clear, concise and he emphasized elements that he has discovered through his teaching experience that tend to be the most problematic for less-experienced paddlers. When errors were made by those of in the class his critiques were well reasoned and clearly explained and in a manner that was gentle on the ego. The learning environment that Steve created allowed those of us in the course to take the critiques as positive and constructive toward our goal: to be the best kayak guide possible. Overall, the course was informative and fun. I feel that any kayaker who is interested in developing leadership, communication and instructional skills should take this very worthwhile course. 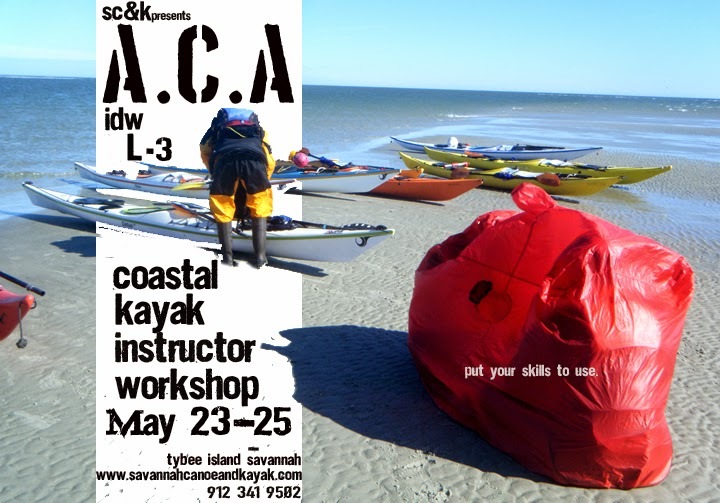 Regardless if the kayaker plans to be a guide or not, the paddling and communication skills developed through this ACA Guide Certification curriculum will help each paddler to practice and promote safety for themself and with those whom the paddler encounters on the water. Our next guide/instructor training session is an L3 Instructor Development Workshop in May. 3 places open.